Welcome to language-easy.org! In this article I’d like to talk about something really essential in nearly every language all over to world: The name of the months. Well, we will also add add the of the four seasons of the year and some more important vocabulary you will need to express the part of the year you are in. So, let’s start right ahead and have a look at the following list with the names of the months in German. Of course, many of the will be quite familiar to you. Nevertheless, there are little differences you should be aware of. After the German name of the month, you can see the corresponding pronunciation. 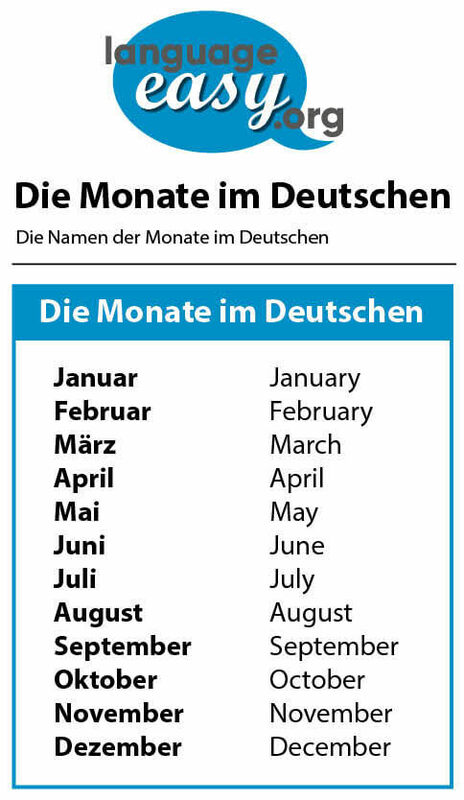 So, in addition to the German name of the months, it can be quite useful to know the names of the different seasons of the year in German. In addition to the names of the seasons in German, I’d like to add some useful vocabulary for each season. Well, as we have cleared up the seasons and the names of the months in German, I think we can add the expression of the date in the German language. Unfortunately, there are slight differences between the way you say the date in the English and the German language – and can lead to confusions in day-to-day situations.